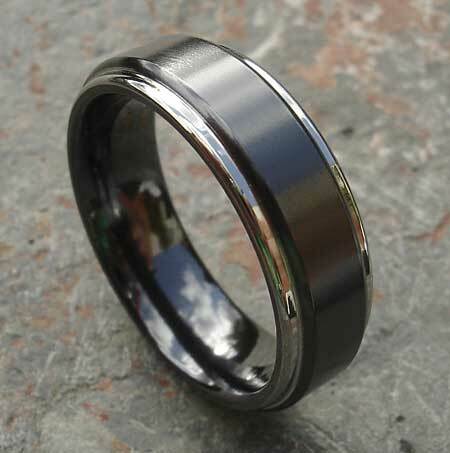 Men's Black Two Tone Wedding Ring : LOVE2HAVE in the UK! 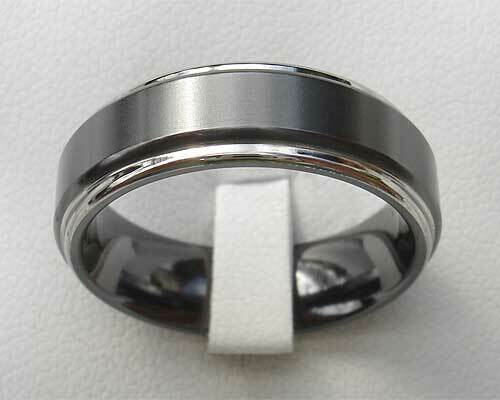 A two-tone wedding ring for men made from zirconium with a raised black inner stepped profile rail. The shaping of this ring comes very stylishly smoothed so there are no sharp edges and the look remains clean and contemporary. The edges are highly polished in natural grey, and the central stepped area is in a beautiful silky matte black. It is available in widths ranging from 4mm all the way to 12mm with the very popular 7mm width version pictured here. All our zirconium rings make great wedding rings for men as they are designed to last a lifetime, and they all come in a variety of prices for everyone to afford. Whatever your budget your zirconium ring will be a wedding ring you will want to look at again and again.